Music, games and DVD chain Zavvi has gone into administration, Ernst & Young has announced, threatening 3,400 jobs. Zavvi's main supplier is Woolworths' unit Entertainment UK (EUK), which went into administration on 27 November. All of Zavvi's stores should be open as normal on Boxing day, for its traditional post-Christmas sale. The retailer is the latest victim of the slump in High Street sales that has seen the administrators called in at tea and coffee specialist Whittards and menswear chain The Officers Club. It employs 2,363 permanent staff and 1,052 temporary staff. Zavvi Ireland is not currently subject to any formal insolvency proceedings. Since Entertainment UK went into administration, Zavvi has had difficulties in sourcing stock and has been forced to enter new trading arrangements. "This has resulted in considerable working capital difficulties," an Ernst & Young statement said. "Since EUK went into administration, and perhaps before, the impact of problems at EUK on the Zavvi group has been significant. "Minimal deliveries, no returns and worse trading terms are just some of the areas impacted," said joint administrator Tom Jack. 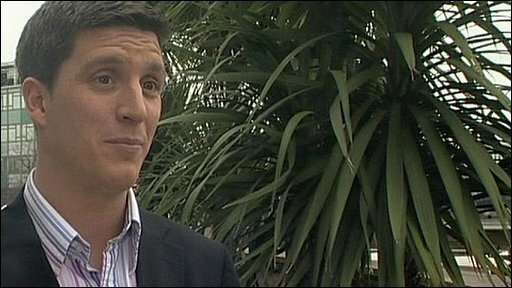 "In the absence of a buyer for EUK, and with dire trading conditions on the High Street, the Zavvi group has seen a material fall in sales and the directors have now been forced to place parts of the group into administration," he added. 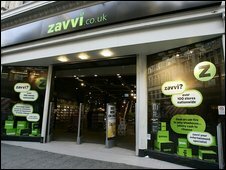 The administrators intend for Zavvi to continue trading with a view to selling all or part of the business. The group's founding partners Simon Douglas and Steve Peckham said: "We have done all that is possible to keep the business trading, but the problems encountered with EUK, and particularly its recent failure, have been too much for the business to cope with." "As soon as EUK went into administration, the writing was on the wall for Zavvi," said Greg Hodge from Planet Retail. "Is there room for a music store on the High Street? The answer is probably no," he added, highlighting the intense competition from digital downloading, online gaming and cheap CDs from the supermarkets. The Zavvi group is the UK's largest independent entertainment retailer with 125 stores, 11 of which are in Ireland. It was formed after a management buy out of the Virgin Megastore division of the Virgin Group in September 2007.